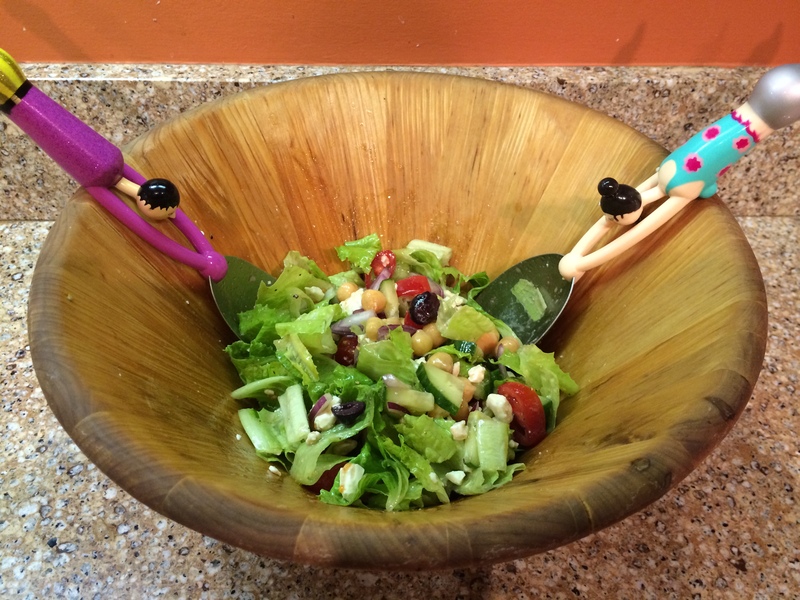 Chopped romaine lettuce, garbanzo beans, grape tomatoes, English cucumber, kalamata olives, red onion, and feta cheese with a citrus vinaigrette. This is a simple recipe for a hearty salad that makes a delicious healthy lunch on busy weekdays. I don’t usually crave salads in the winter, but this one is the exception. It is filled with fresh vegetables, and the chick peas and feta cheese add plenty of carbs and protein and ramp it up several notches on the satisfaction scale. This meal hits every note for me: the vegetables are crisp and tasty, the olives, onions and feta cheese give it the zip of a Greek salad, the vinaigrette is tangy and citrusy, and the tasty little garbanzo beans transform it into a filling meal. 1. Put all of the salad ingredients into a salad bowl. 2. Combine the ingredients for the salad dressing separately in a small jar. 3. Pour the dressing over the salad. 4. Toss and serve in a large bowl. Nice Salad! Refreshing and so good for you. It has all my favorite components including chickpeas and feta! And your vinaigrette sounds amazing! I never thought to use agave. I always use honey. I will have to add that to my list now, too. Yum! Thanks, Shamim! 🙂 It is definitely one of my favorites. I used to use honey in my dressing as well. I’ve found that agave blends in with the other ingredients much more quickly and the result is delicious. I love all ingredients in this salad. I think this was totally meant for me…the addition of Feta crowns it all. Have a great week! Thanks Liz! 🙂 I hope you get a chance to try it soon. So nice to hear from you! Hope you’re doing well. yes please 🙂 Seems there are a few Lizs here, so I will add another with a recipe for roasted chickpeas I just saw this morning. Thinking you would like. ?? Viva la chickpea! Love what you’ve done with them here. Ooh yummy! I shall definitely try those bbq roasted chick peas – great idea!